Heartworm is a serious and potentially fatal condition caused by parasitic worms that live in the heart, and blood vessels that supply blood to the lungs of infected animals. Pets can contract heartworm disease from mosquitoes that are infected with heartworm parasites. When an infected mosquito bites an uninfected dog, it injects the immature worms into the tissue of the animal through its saliva. Once injected, the immature worms develop, migrating to the lungs and potentially the heart, where they mature into adults and begin to reproduce. These worms can grow to a length of 15-30 centimetres, and in severe cases a dog may be infested with hundreds of worms. Mature worms produce thousands of larvae that can then be spread to other dogs or cats by mosquitoes. The infestation can result in damage to the heart, lungs and liver. The pet may die as a result of severe damage to the internal organs. Heartworm is a disease that poses a serious threat to pets in Canada and the United States, and especially to dogs. The good news is that it can be easily prevented through regular testing and the use of preventive medication. A study on “Heartworm in dogs in Canada in 2010” published by the Ontario Veterinary College’s Department of Pathobiology at the University of Guelph has revealed a 60 per cent increase in the number of dogs in Ontario with heartworm since the last study of its kind was conducted in 2002. The Canada-wide study showed that 564 dogs tested positive for heartworm in Canada in 2010; 431 of those dogs were located in Ontario (that’s over 75 per cent of the total). Also of concern is that eighty per cent of animals that were found to have heartworm had not been on a heartworm preventive medication. In a few cases, pets that had been receiving heartworm preventive medication also tested positive for the disease; the most common reason for this was that the pet owners indicated they had forgotten to give their pet the preventive medication at the prescribed intervals. Without regular testing, heartworm disease is usually only detected after the disease has progressed, in which case irreversible damage may have already been done to the internal organs. In advanced cases, clinical symptoms may include: general listlessness, a chronic cough, laboured breathing, and weight loss. The animal may also tire easily during exercise and could collapse due to heart failure. In some cases, pets will not show clinical signs even though that may be hosting one or two adult worms, but internal damage is still being done and most of these dogs are still infectious. What happens if my pet tests positive for Heartworm? Treatment for heartworm disease is available, but it is costly and is not without dangers. Treatment involves a series of injections to kill the adult worms, and then a treatment to kill the immature worms in the bloodstream. Heartworm can be easily prevented in Ontario. Your veterinarian will begin by examining a sample of your dog (or cats) blood for the presence of adult parasites. This is typically done between April 15th – June 1st. If your dog is not infected and depending on the risk of infection, a preventive program should be started. The preventive program involves giving the dog a pill or applying a solution to the skin once a month during mosquito season, which (in Ontario) typically runs from June to November. This medication destroys the immature heartworms transmitted by the mosquitoes and stops the cycle of the parasites. 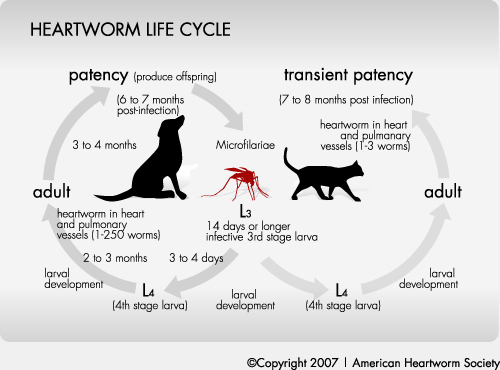 Heartworm will never be completely eliminated because it exists in the wild animal population and cannot be fully controlled. This will, unfortunately, act as another source of infection for the pet population. Preventive programs should not be started before your dog has been tested for the presence of heartworm infection by your veterinarian. Pet owners who vacation in the United States with their dogs should consult their veterinarian regarding the best way to provide continual protection against this easily preventable disease. Heartworm is an epidemic in some areas of the States. As veterinarians, we get asked many questions about this parasite and how to prevent it. The most common questions are reviewed below.